Works under water and in oil. 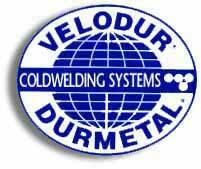 The DURMETAL® Coldwelding Systems® consists of various size Repair Kits tailor made for your needs. Kits are packaged to make multiple	repairs and are designed as a Preventive Maintenance system ready for use when a repair situation arises. Each Kit contains 2 Basic Products: DURMETAL® SUPER CA-HD Rapid® and DURMETAL® Standard and has a shelf life which is guaranteed or we exchange the defective part of the kit free of charge. SUPER CA-HD RAPID® Base and Activator is the only known product worldwide to stop leaks on oily, greasy or wet surfaces. It works submerged in water and oil. SUPER CA-HD RAPID® cures in 3-4 minutes. STANDARD Base and Activator is used for repairs on dry surfaces combining metallic and non-metallic materials. STANDARD cures in 3-4 hours and provides a permanent repair that can be machined or drilled. Technical data guarantee: You as the specialist in your industry can decide how to utilize DURMETAL® within the framework of these technical data. Your repairs will be carried out successfully all the time. Performance guarantee through high quality control standards. Shelf Life Guarantee: We guarantee the Shelf Life as long as you actively work with your DURMETAL® REPAIR KIT or we will replace a defective part of your DURMETAL® KIT free.